In the Miami Herald, a recent article describes plans for the development of a new high-end condominium in Miami. Ugo Colombo is partnering with developer Vladislav Doronin of Capital Group for his latest architectural project, a 65 story luxury residential and commercial structure at Brickell Plaza and South Miami Avenue. As the name suggests, the Brickell Flatiron will resemble, in its tall triangular shape, the iconic Flatiron building of New York. The Brickell Flatiron will stand apart with a design emphasis of fluid lines and rounded corners, striking the Miami skyline with an air of elegant prominence. The building is set to house 552 condos and 40.000 square feet for retail development, including a restaurant and upscale shops. A spa and rooftop swimming pool will be available and plans for penthouse units are still in the works. Condos will average 1,200 square feet and will be designed with floor-to-ceiling glass exteriors and elliptical balconies, many of which will overlook the plaza. Plans include a second building to be developed in the future. 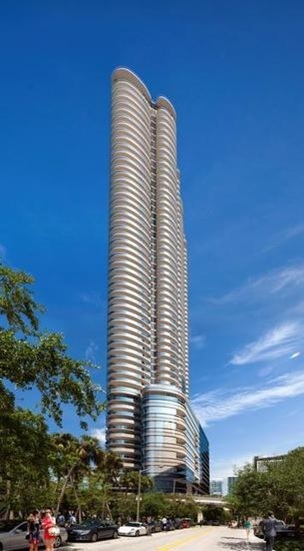 This entry was posted in News and tagged brickell flatiron miami, CMC Group, Ugo Colombo, ugo colombo brickell flatiron, ugo colombo cmc group, Ugo Colombo The Collection on May 19, 2014 by Ugo Colombo.